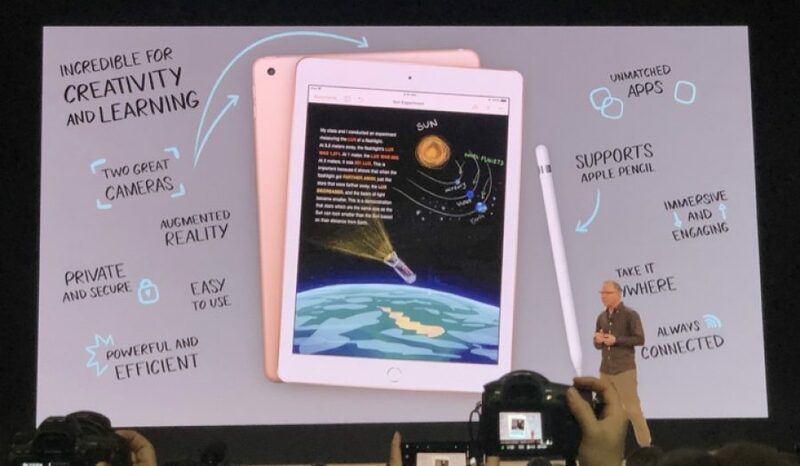 At the company’s education-focused event today, Apple VP of Product Marketing Greg “Joz” Joswiak introduced a new 9.7-inch iPad with a faster A10 Fusion chip and support for the $99 Apple Pencil. It’s available now directly from Apple. The sixth-generation iPad retains the same physical dimensions and colors — silver, gold, and space gray — as the previous fifth-generation iPad, so there should be no compatibility issues with cases or accessories. It continues to come in 32 GB and 128 GB models, either with just Wi-Fi or with Wi-Fi and cellular capabilities. And pricing remains the same as well, starting at $329 for 32 GB. Increasing storage to 128 GB adds $100, and cellular adds $130. Education pricing for the sixth-generation iPad starts at $299, and the Apple Pencil will reportedly cost schools $89. The most notable change in the sixth-generation iPad is its support for the Apple Pencil, which requires a high-resolution touch sensor in the iPad’s Retina screen. Apple also integrated palm rejection technology so you can rest your hand on the iPad’s screen while drawing or writing. For education, where the Apple Pencil enables a variety of helpful interaction methods, this new support is extremely welcome, but we anticipate that Apple will sell a boatload of Apple Pencils to non-students who previously couldn’t justify the $649 starting price of the iPad Pro along with the $99 Apple Pencil. Apple Pencil owners will appreciate the new Apple Pencil-related capabilities that Apple is adding to iWork. Users of Pages, Numbers, and Keynote can now draw or write directly in those apps, and a Smart Annotation feature anchors comments and proof marks made with an Apple Pencil to the underlying text. Apple also made a big deal about the role of AR — augmented reality — in education, pointing out that the sixth-generation iPad has the necessary power to provide an immersive experience thanks to its beefier A10 Fusion chip and embedded M10 coprocessor (up from an A9 with M9 coprocessor in the previous model). The basic specs of the sixth-generation iPad’s cameras remain the same: an 8-megapixel rear-facing camera that’s capable of 1080p HD video recording, coupled with a 1.2-megapixel front-facing FaceTime HD camera. However, the new model’s extra processing power undoubtedly plays a role in enabling support for taking Live Photos and providing both face and body detection. The previous model could do only face detection and didn’t take Live Photos. Also new in the sixth-generation iPad is support for Retina Flash, which turns the screen into a giant flash when taking selfies. If you’ve been waiting to replace a fourth-generation iPad or earlier, the sixth-generation iPad would appear to be a fine update to the iPad line. However, for those with an iPad Air, iPad Air 2, or the previous fifth-generation iPad, the performance boost probably isn’t sufficient on its own to justify an upgrade. The exception is anyone who has been wanting to take advantage of the Apple Pencil but unwilling to jump all the way to an iPad Pro. During the education event, Apple also announced a pair of products from Logitech that will be available only to the education market. The Logitech Crayon is a $49 stylus that’s the first MFI-approved stylus for the iPad. It doesn’t need to be paired via Bluetooth, so it can work with any iPad at any time (think of a teacher going around in a classroom), but loses pressure sensitivity because of that choice. Logitech’s Rugged Combo 2 keyboard case answers the lack of a Smart Connector. In fact, it comes with its own custom connector, so the keyboard can be detached. Good summary. iPad Air 1 is sluggish in iOS 11 so I suggest you recommend an upgrade for that iPad also. My 4 is definitely sluggish but still serviceable. The iPad longevity is certainly an issue for Apple, they seem so much more long lived than equivalent Macs. The 10.5 Pro is still the iPad I want. Even if it will be double the price of this new version.